As I’ve mentioned before, I think it’s really important to keep your intake of red meat to a minimum (once/week maximum). Red meat can be high in saturated fats, it’s a source of heme-iron (too much can cause inflammation & cholesterol build-up) and it has an acidic effect in your body, which can cause the depletion of important alkalizing minerals (ie. calcium). All that being said, I do enjoy red meat from time to time – especially the pork in Barbados. “Bajan Pork…is considered by many to be some of the best in the world – possibly something to do with the quality of the water.” The pork, beef, black belly lamb & chicken are all “local government inspected & stamped” (1). I also read that Bajan pigs are respected, and treated humanely, which is sadly not the case in most countries. Using a slow cooker, I’ve developed a super easy & delicious pulled pork recipe that you must try. It’s perfect for entertaining because it’s so easy, but tastes like you put in more effort than you did – perfect. Place the onion slices in a single layer at the bottom of your slowcooker. Put the pork roast on top of the onions, and pour in the ginger ale. Cover & cook on high for 4 hours, or on low for 8 hours. When pork is done, in a small saucepan combine all the ingredients for the sauce and cook on low-medium heat for 5-10 minutes. Remove pork from the slowcooker and place it in a large bowl. Using two forks (one to hold it in place & the other to the shred meat) pull the pork. Remove onions from the ginger ale liquid and add them to the sauce. Discard the rest of the liquid. Put the pulled pork meat back in the slowcooker, mix in the sauce and turn it on warm until you’re ready to eat. 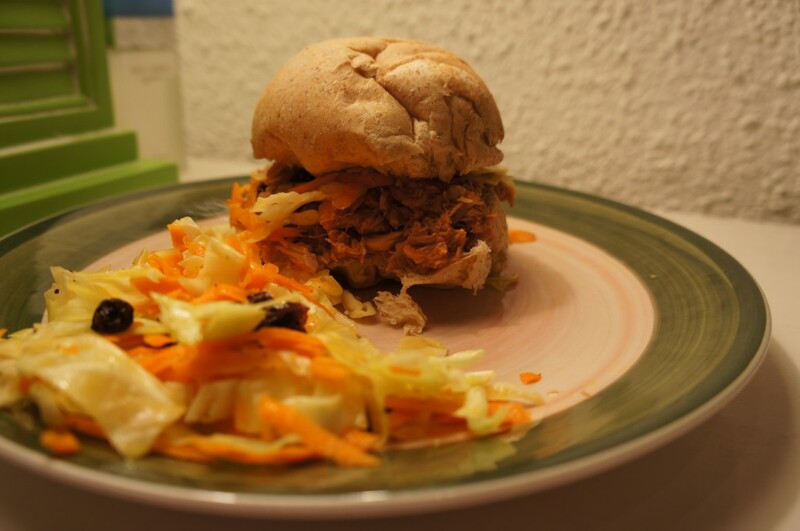 We usually have our pulled pork with fresh whole-wheat buns & healthy coleslaw. Happy entertaining!